and the Environmental Dept of Amazon. This project purpose is to create a sustainable way to develop new productive alternatives for their life while at the same time, protecting their land and culture and improving they life quality. Pirarucu, is the first and only exclusive fly-fishing only project allowed and supported by Brazilian Government with focus on Arapaima. Environmental Officials worked together with the local Association to create these very first official sport fishing operations in Brazil. 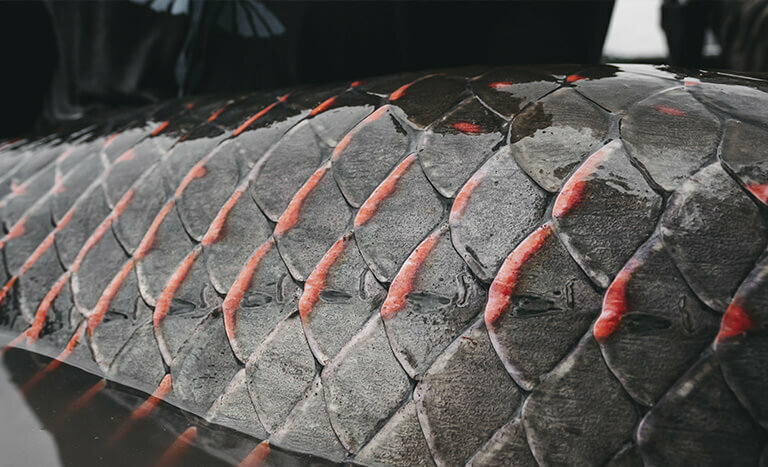 Pirarucu project was based as a long-term environmental and social project which supports the preservation of the Arapaima and fish species inside Mamirauá Reserve and all local communities there by improving their quality of life. The local association are the mangers and participate in all aspects of this world class fishing project. We cooperate with government fisheries management officials and various other government agencies in developing research programs and the collection of biological data to further understand the fishery and ecosystems. The data we secure will be used to ensure that our waters, the surrounding ecosystem and local people will maintain their vitality and be protected for generations. We work in a unique Arapaima environment, perhaps the last and biggest reserve in the planet for this fish. Our goal is to provide anglers the very best fishing experience in its class. We respect the magnificent jungle fish and share the same belief as our local partners. Protect Arapaima will keep this fishery protected for generations and will help local communities to move forward in a sustainable activity. We work very closely and cooperatively with government agencies and local native communities in securing and maintaining the proper permits and licenses. 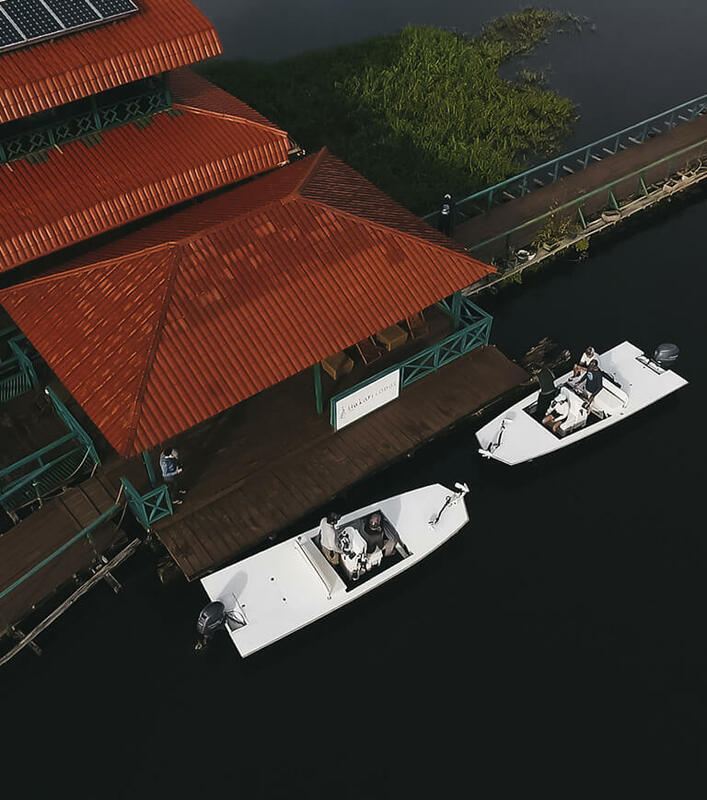 This guarantees the exclusive use and control of the Arapaima world-class fishery ensuring a sustainable and non-consumptive use of the resource. Untamed Angling has designed a unique working platform for all its projects: a team formed by a professional and a native guide working together. The pro guide provides specific technical skills and the native guide intensive knowledge of the forest and the fish. Simple logistics for our guest make Pirarucu the easiest to reach yet remote jungle destination available. The lodge is located in the heart of the reserve and is unique eco buildings with the exclusive service and attention. Mamirauá Sustainable Development Reserve is a state protected area with an extension of 1.124.000 ha, located between Solimões, Japurá and Auti-Paraná rivers. It’s the biggest protected flooded forest in the world. Only 4% of Brazilian Amazon consists of freshwater swamp forest and Mamirauá Reserve plays an important role to protect this ecosystem. It’s inserted in the Central Amazon Corridor and it’s part of the Amazon Biosphere Reserve. Besides, it’s a recognized Brazilian reserve by Ramsar Convention, that protects wetlands of great importance. Every year the reserve goes through high and low water levels. The variation among the crest of these two stages is about 10 to 12 meters. The flood variation, the geological history and geography of the place give Mamirauá high levels of endemism and particular species. The water in the core of the reserve is called “black water” in the Amazon, which, despite dark tinting from jungle leaves, is actually quite clear, allowing for sight casting opportunities for a variety of different species. Mamirauá is a perfect place for non-angler companion to experience the Amazon jungle. The lodge offers an extensive program of daily-guided (English speaking guides) tours and activities, making this destination a perfect family trip. The season at Pirarucú runs from September to the end of November.  The dry season in this part of the Amazon runs from July through January so this season straddles the middle of the dry season when water should be low and fish congregating in the lakes and channels. 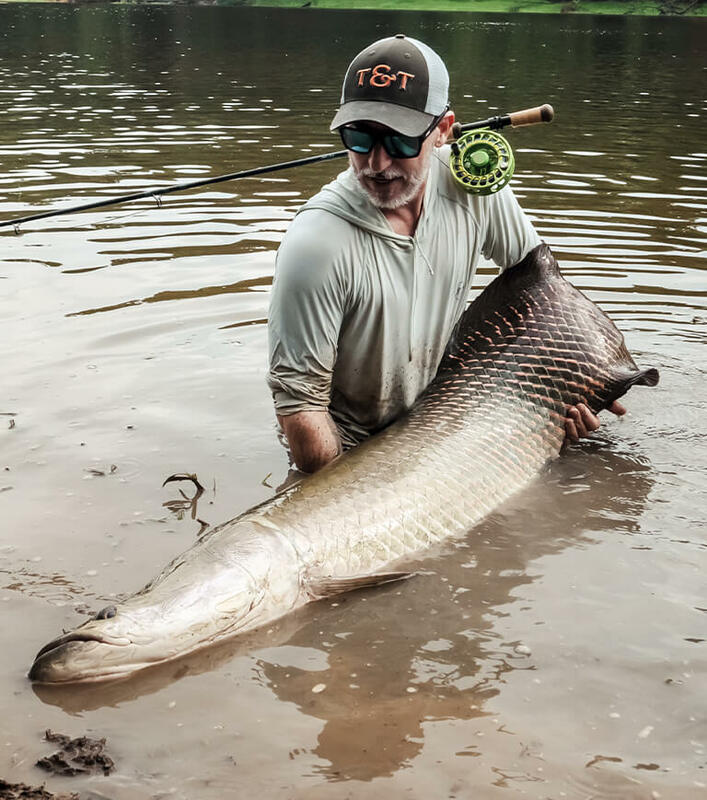 November 30th marks the end of fishing due to special regulations from the environmental authorities in Brazil who close any kind of fishing for Arapaima throughout the Amazon to protect juvenile fish. The floating lodge is simply unique. Comfortable and beautiful it is constructed of local woods following the CAboclos local style it is utilized during other times of year as a ecoturism lodge primarily for birdwatching and wildlife viewing (the area is one of the top five birdwatching areas in the Amazon). The lodge has ten floating cabins each with twoen suite rooms four of which have been refurbished to accommodate our angling guests. The main lodge building features a dining room living room and kitchen. Everything is on the water connected with wood platforms. 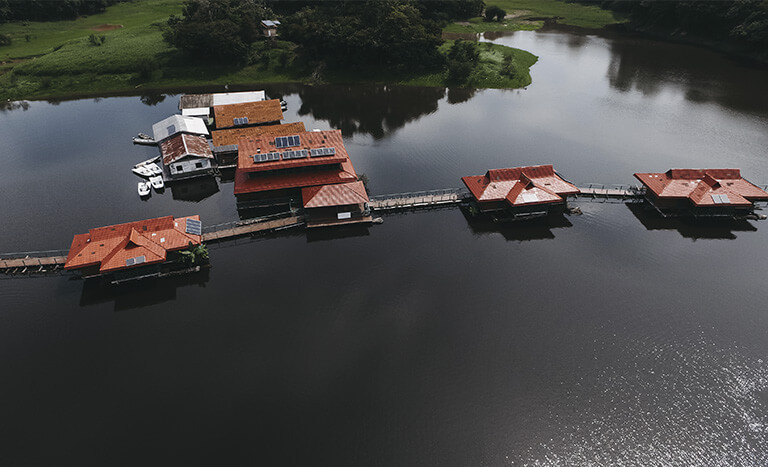 The lodge is located in the heart of the reserve with very short run times to the fishing in fact most days guests will return to the lodge for a well-prepared lunch before returning for an afternoon fishing session. Satellite phone and internet are available. jungle destination available! 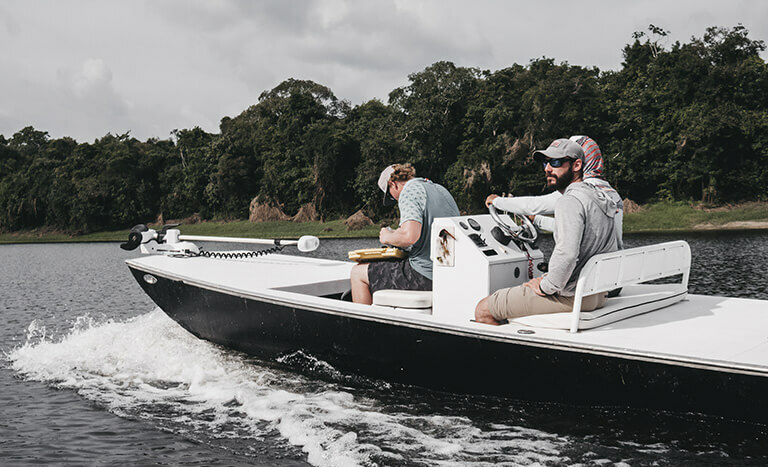 Anglers will enjoy an all-inclusive package (except international and domestic flights) with a five days of fishing plus six nights lodging including the first night at the Tropical Hotel Shorter programs and combo trips with Rio Marié are also available. The maximum group size is six anglers. Pirarucú is a perfect destination for non anglers and families since the Uakari lodge run a very well planned and long time recognized eco tourism programs for Bird Watching Wild Life. expeditions. Photo safaris. Canoeing. Experiencing the local culture and nature. 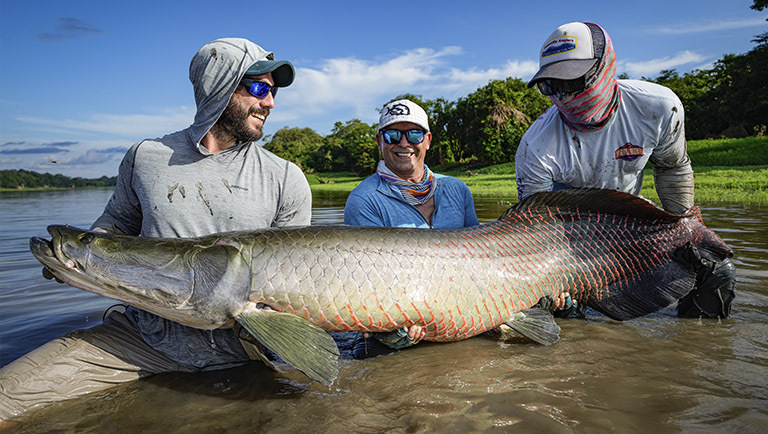 What really sets Pirarucú apart from other destinations is its namesake The Arapaima. Pirarucú is the guarani and portuguese name for the Arapaima and her synonyms for the same fish. Arapaima can grow to over 400 pounds and most closely resemble a freshwater tarpon. When hooked they explode in aerial displays take off on long runs and surrender only after lengthy battles. The fish are often seen gulping air from the surface thus offering sight casting to singles pairs or even schools of fish. Arapaima is a very resistant fish out of the water that take up to 70% of the oxygen needed to live from the air. Arowana - There´s no other place where you can catch so many Arowanas on the fly. These wonderful fish are also omnivorous and eat almost about any insect or bait fish presented to them. Sight casting delight! that is a close relative of the Pacu and can grow up to 100 pounds. At Mamirauá is normally found in the 8 to 24 pound range. Peacock Bass - Yellow species - These smaller peacock bass range in size from 2 to 8 pounds and act much like their larger cousins found elsewhere in the Amazon. Arapaima: 10wt rod with floating / intermediate lines for the smaller Arapaima and 11/12wt rods are recommended for the larger fish and sinking lines. All rigs require strong leaders (80-100# test) rigged with large streamers that imitate the baitfish found in the Arapaima`s home waters. Other Species: 6wt rod with Floating Lines and top water and big dry flies for Arowana and Peacocks and 8/gwt rod with floating line for the Tambaqui using streamers and berry imitations. Six months ago at Untamed Angling´s Pirarucú lodge, i caught one of my most unique species to date on fly, the Pirarucú. Once hooked, they perform awesome displays of their strength with violent head thrashes and occasional jumps. 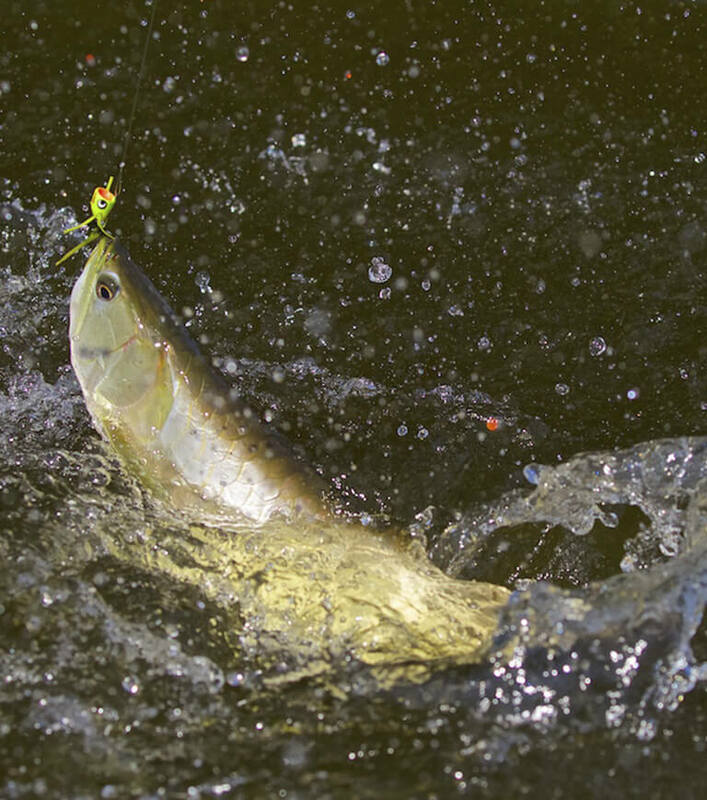 A hard fighting fish that can grow to over 400lbs, it is definitely worth a go on a fly. "Pirarucu is like going back in time to an untouched Amazon! I was fortunate to be tied into the fish of a lifetime! The giant measured over 8ft in length and estimated over 300lbs!”. 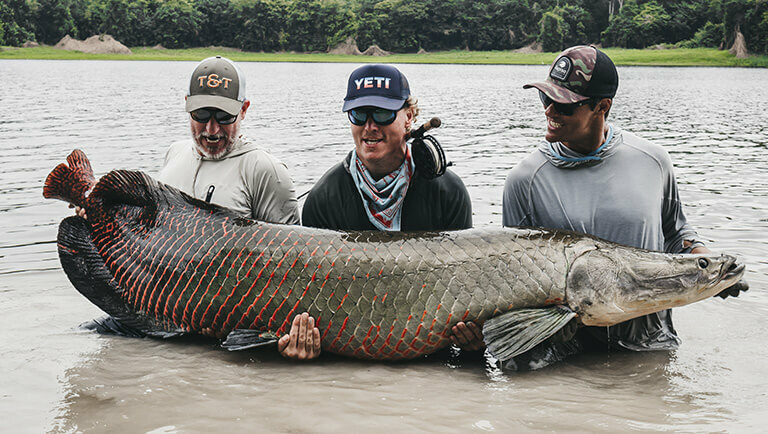 "This is possibly the largest population of massive Arapaima in the World. 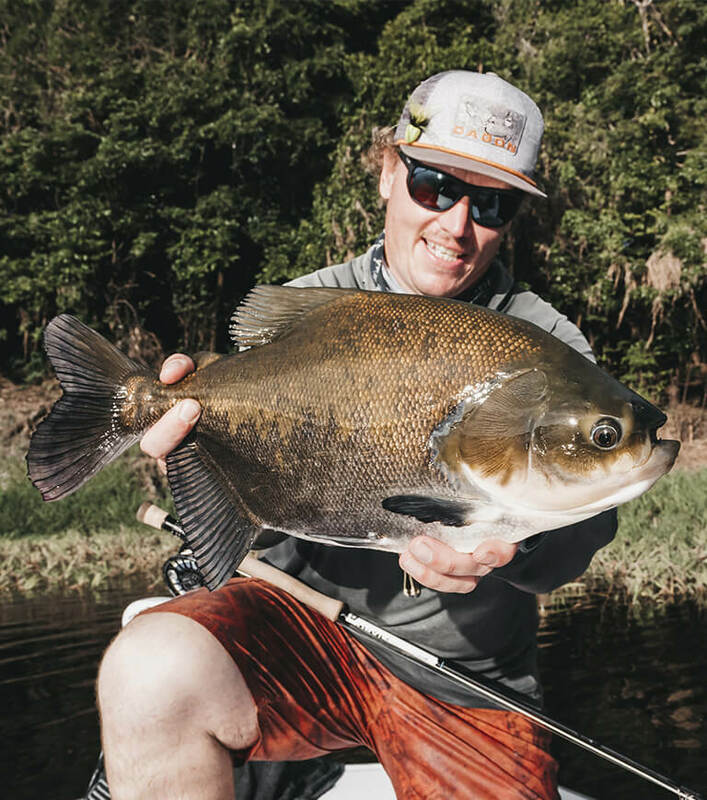 Untamed Angling has created a sustainable, catch and release, fly-fish only destination to support local natives is the most profound aspect of this travel destination. This is a trip of a life time for both angler and conservationist alike”.